Improve the ride and carrying capability, remove the sagging! Having problems with sagging coil springs? 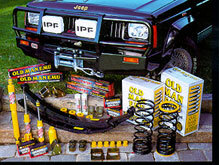 We offer a complete line of front and rear coil suspension springs and accessories. These coils provide improved ride and some lift, these front coil springs are available for Land Rovers, LandCruiser, 4 Runners, Montero, Jeep Cherokee, Wrangler, XJ, TJ and ZJ's, GEO's and Nissan's. Sagging suspension, a harsh and uncomfortable ride on road and lack of wheel travel off road are just some of the problems which are experienced by four wheel drivers with standard suspensions. Old Man Emu designs a range of coil springs for each specific vehicle, enabling you to match the appropriate springs to the intended application. While ride height increases are attained, our emphasis is placed on ride control improvements. Allowing you to tuning the springs to matched the corresponding set of Old Man Emu shock absorbers, delivering a fully integrated system, designed specifically to suit your vehicle. A 4WD equipped with this combination will provide better towing and load carrying characteristics, improved wheel travel, and will ride and handle better over any road surface. Old Man Emu manufactures a complete range of fully integrated suspension components which includes: coil and leaf springs; shock absorbers and struts; greasable shackles; steering stabilizers; polyurethane bushings; and a complete range of U bolts and other suspension hardware. Off road vehicle manufactures are often forced to compromise on their suspension designs because their vehicles have to cater to a wide customer base with very different application requirements. Ranging from city driving and general family use to the extremes of off road and heavy load carrying applications of mining companies, standard suspension just cannot cope with all the needs of the individual applications. Emu coil springs are formed on precision mandrels to ensure exacting quality, and are available in variable or constant rate depending on the application. All OME coils are shot peened, fully scragged and load tested to reduce spring stress and enhance spring life. The components and systems are all designed to work with each other, OME supplies all the necessary hardware & accessories to complement its range of springs and shock absorbers. These items include polyurethane bushings to allow quieter and freer movement of leaf springs; steering stabilizers; and easy to service greasable shackles. A large assortment of U bolts, fitting kits and trim packers complete the range and ensure perfect fit of all components, every time. We also offer complete suspension kits . OME760 Front Discovery & Range Rover to 45 LBS. OME761 Front Land Rover Medium Duty Coil Spring to 110 Lbs.